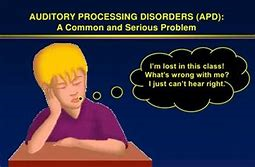 Auditory Processing Disorder (APD), also known as central auditory processing disorder (CAPD), is an umbrella term for a variety of disorders that affect the way the brain processes auditory information. Individuals with APD usually have normal structure and function of the outer, middle and inner ear (peripheral hearing); but are unable to process the information they hear in the same way as others do. This leads to difficulties in recognizing and interpreting sounds; especially the sounds composing speech. This causes listening problems in these individuals that often mimic a hearing loss. Does your child exhibit signs of auditory processing disorder? there is a good possibility that they are struggling due to an auditory processing disorder and/or poorly developed cognitive learning skills. Regardless of the cause, we at Think Smart Center have had great success in eliminating the struggles that these individuals face. Our Cognitive Development involves training to strengthen the underlying skills necessary for proper auditory processing. These auditory processing skills along with other cognitive abilities are the foundation that enable learning to be easier and faster. These skills also are the cornerstone of good social interaction that provide good listening skills and proper verbal expression. When learning is improved and making friends becomes easier, a persons confidence and self-esteem is dramatically improved. We have had great success in eliminating the struggles that these individuals face. For more information about our program, call Connie at the Think Smart Center.